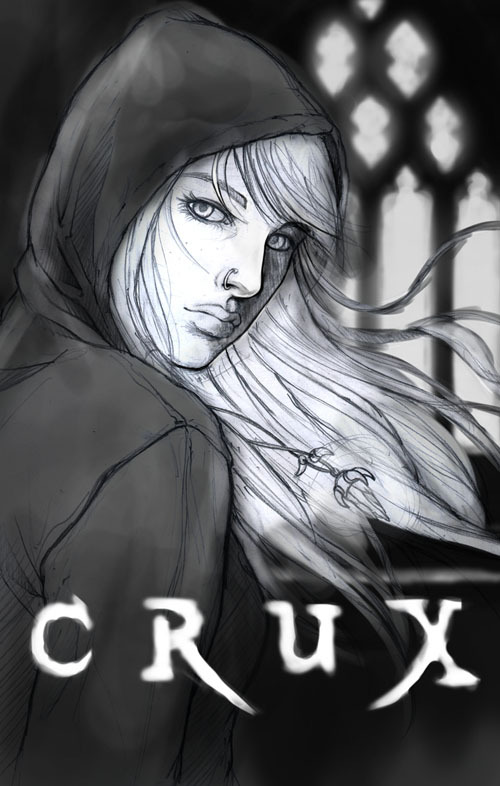 Today, I want to brag about friend and artist Francisco Etchart the young man that did the cover for my debut novel Crux. Buddy and talented writer J.A. Belfield emailed me and suggested I blog about the road I traveled ( along with my publisher J Taylor) to find the perfect cover for my book. Ha! Little did I know, Franciso had already put this collage together illustrating the steps we went through to get to the finished product. I know that you are in a hurry with the cover right now, so I will do my best. much more cool than these sketches. I like drawing # one. Do you like these? I love picture 01 … but (there is always one, right?) Grey seems too ‘in focus’ if you know what I mean. I kinda expected him to be behind the windows because right now he’s like this thing in between Birdie and the Window which means he has no ‘purpose’. If he were behind the windows, then it would add mystery. As it is, he’s plunked in between. It’s really hard for me to describe, but it has to do with depth and perception of depth. He’s perfect from a ‘Grey’ perspective, I just think his placement is off. Make sense?? Did you get the notes from my publisher about the book cover I sent? Sorry, we’d like to make some changes, but I just want you to know I love your work. 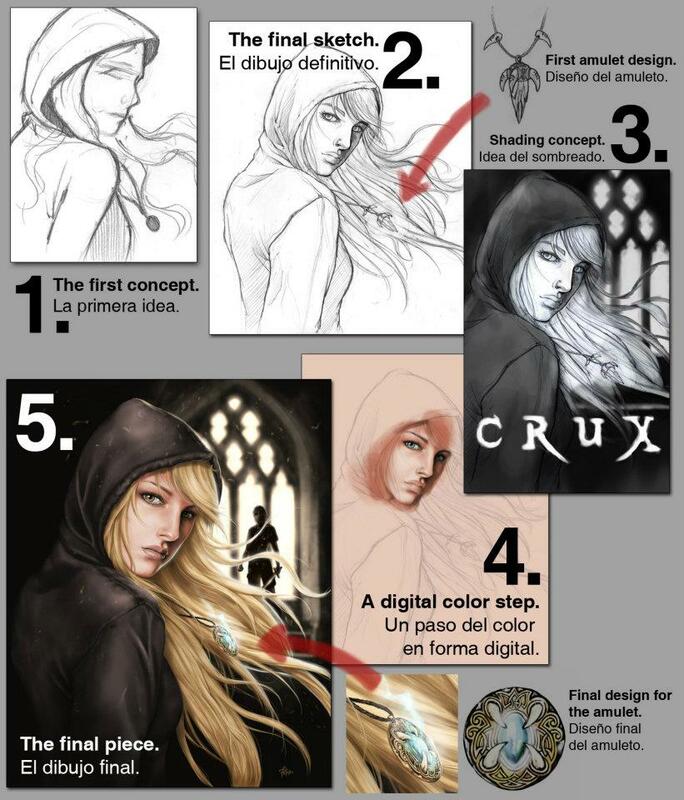 In the end, if my publisher won’t go for your drawings, I will still pay you and use the picture on my website. Hopefully they will like it fine now, maybe you have a better idea of what they want. Have a good day. Hello Julie! 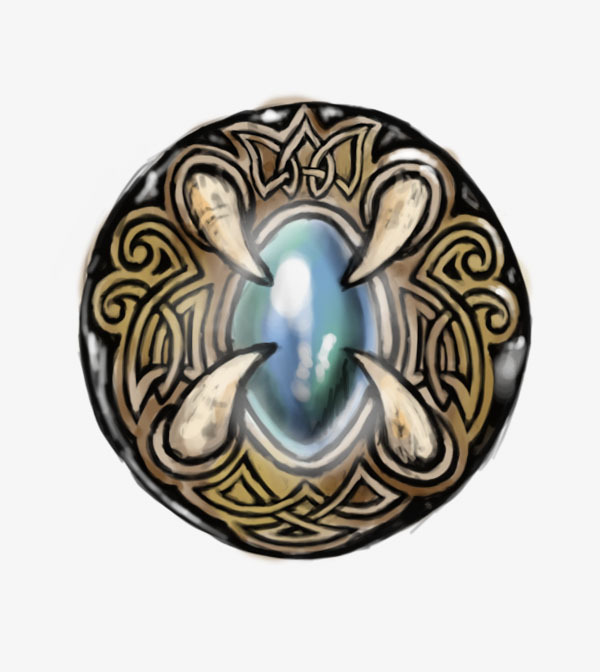 Take a look to the new amulet and tell me if you like it. Of course that this is just a sketch. I tried to include all the elements you wanted: water, fire, wings and fangs. First of all, did you like the girl and the amulet? Second, I added more details to the sword, Grey´s head and hair and his right fist, so I hope you like it now. As you recropped the image, the structure of the window is almost out, so I decided to do another version (number 05) where I nudged a little the window, maybe you like it. When you have the final version of the cover with the text, I would like to see it. Took me a while to see what he meant by ‘nudge’ the window. 😉 Looks like he scooted it down vertically. I prefer 04 in that case because we don’t want that frame to show at all. If you’re happy with 04, I’m happy with 04 and we can call the imagery done. 🙂 We’ll work on the rest of the content very soon. your designer will have to crop it. I did it on purpouse because the printer. it, but I just wanted to see how it would look. everywhere and especially the face of the girl. and use it for the book, of course. I have read all the notes and I guess I am going to have the full color version finished for tonight. 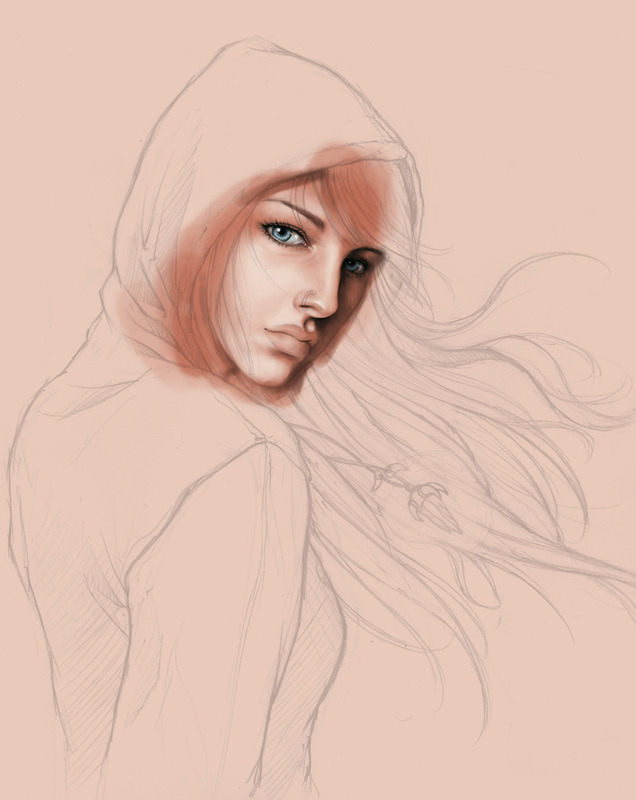 Now, just for your eyes, I let you a preview from yesterday when I started with the colors. The current drawing is much more advanced and almost finished right now but I have to do some final touches tonight. Picture is wonderful! Here is a copy of the release, please sign and return. Can you scan it or something to get it to me? Thanks! Of course, when I put the artwork in my site I will link it to your site and Taylor Publishing. Thank you so much for chose me between so many artists in the net. About the release, what is exactly to you the “release”? Sorry for my English, it´s not perfect and sometimes I don´t know some words or expressions. And “release” has many meanings. Just in case, I am sending again the contract (as an image and Word) and the final picture. Note: Isn’t he so cute? I love the accent. And that’s it! Some of the back and forth between artist, writer and publisher. This was so much fun to work together from concept to finished product and the beautiful result all lies on Fransico’s wonderful shoulders. 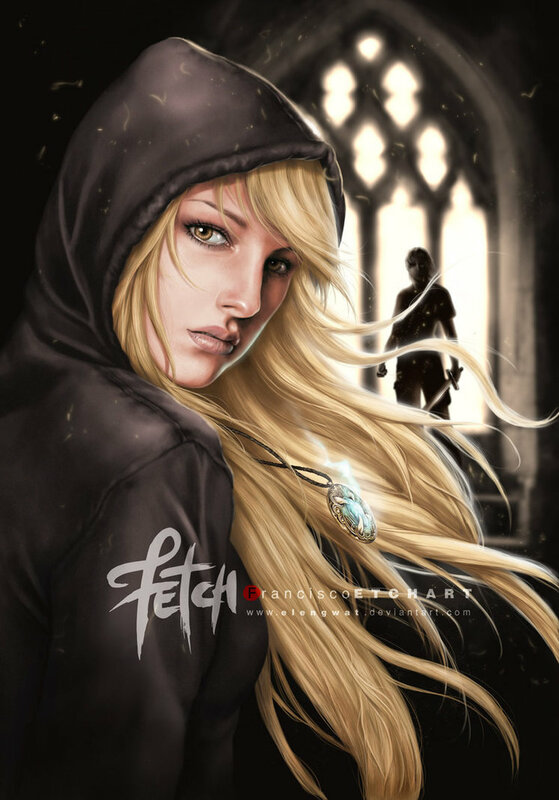 ♥ I love my cover. Everyone has different taste because covers are art. Which leads me to this question … what draws you to a book cover? Which are your favorites? Leave me a comment and tell me, I’m dying to know!